Cherry Ridge Cabin’s owners, Mike and Vesta Matis, welcome you to their modernly furnished cabins located in the mountains of Bald Eagle Valley, Centre County. Summer, Spring or Fall, come relax and enjoy nature. Rent a cabin (or two) for a family reunion, Penn State football weekend, hunting, fishing, or even a honeymoon. 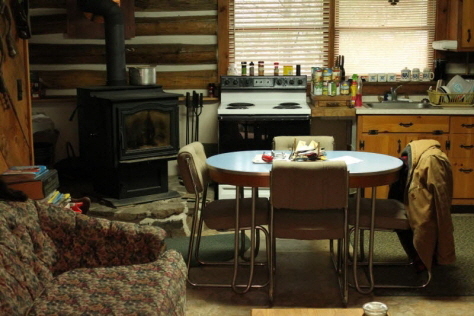 Cherry Ridge Cabins sleep 4-6 people and are furnished with a kitchen, bath, running water, heat, refrigerator, electric stove, cooking utensils, dishes, and silverware. The only things you need to bring are your own bedding, linens, towels and food. Bring the kids along too! They’ll love our covered wagon, caboose and playground, A Finnish sauna is also available to renters. Cherry Ridge Cabins also has a social hall which provides seating for 40 – 50 people. Use of the social hall is free if one group rents all the cabins. Call 814-355-5916 or email us today for more information on reserving your dream weekend.